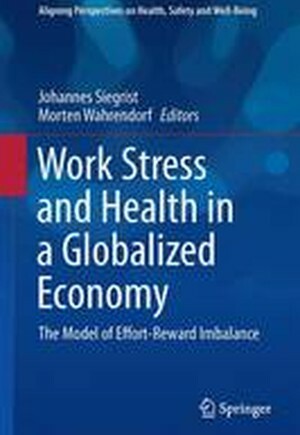 This book provides a comprehensive, updated summary of research evidence on the effects of stressful working and employment conditions on workers' health, as based on one of the worldwide leading theoretical models, effort-reward imbalance. It offers three innovative features that are appealing for research as well as for policy. Firstly, it presents and discusses comparable research findings from different continents, in particular from Japan, China, and Latin America. Secondly, it extends the conceptual framework of research on this topic by analysing associations of work stress with health in a life course perspective, and by linking these associations to the macro-level of national labour and social policies. Thirdly, the book helps to strengthen programs and policies that aim at promoting healthy work locally, nationally, and internationally, by providing solid facts on which such programs can be based. Foreword.- Preface by Editors.- Part I: Effort-reward imbalance: Theory, measurement, and research perspectives.- Chapter 1: The theoretical model.- Chapter 2: Measuring effort-reward imbalance at work.- Chapter 3: A life course perspective.- Chapter 4: A social inequality and policy perspective.- Part II: Work stress and health: Reviewing the research evidence.- Chapter 5: Cardiovascular diseases.- Chapter 6: Affective disorders.- Chapter 7: Absenteeism and disability pensions.- Chapter 8: Pathways from work stress to reduced health: experimental and naturalistic studies.- Part III: The context of economic globalization.- Chapter 9: The case of Japan.- Chapter 10: The case of China.- Chapter 11: The case of Latin America.- Chapter 12: The case of Australia.- Part IV: Extensions beyond paid work.- Chapter 13: Failed social reciprocity in core areas of the life course.- Chapter 14: House and family work and health.- Part V: Interventions and policy implications.- Chapter 15: Improving interpersonal relations at work.- Chapter 16: Changing organizational structures and processes.- Chapter 17: Challenges of national and international policies.- List of Contributors.- Index.